EDCOE is pleased to announce that First 5 El Dorado’s Executive Director Kathleen Guerrero and El Dorado County Child Care and Education Planning Council’s Coordinator Elizabeth Blakemore were recognized by State Superintendent of Public Instruction Tom Torlakson for their work with the Race to the Top—Early Learning Challenge Grant. The Race to the Top—Early Learning Challenge (RTT-ELC) supports states’ efforts to increase the percentage of low-income and disadvantaged children enrolled in high-quality early care and education programs. Through Kathleen and Elizabeth’s efforts, El Dorado County has leveraged state, regional, and local RTT-ELC grant funding to maximize services and impact. This partnership, or “consortia,” is a subcommittee of the El Dorado Early Care and Education Council which is facilitated by First 5 El Dorado. As part of their partnership with RTT-ELC, the consortia has implemented a Quality Rating and Improvement System (QRIS), “High 5 for Quality,” based upon the statewide RTT-ELC childcare assessment matrix. The QRIS Matrix outlines the key elements in a high-quality early care and education program. Beyond rating early childhood education programs, licensed providers in the County are now eligible for new program services including on-site mentoring, college coursework, professional development, and participation incentives. The team recognizes that early learning begins before kindergarten. According to Ready Nation, “Children that are ready for school score higher on third-grade reading tests, a predictor of high school graduation rates.” Since the initiation of the High 5 for Quality system, 58 percent of the County’s licensed early care and education providers have enrolled, and 78 percent of these providers reported using screenings, assessments, and site improvement plans to provide high-quality services. By the end of 2015, 45 percent of these participating sites were rated Tier 3 or above, out of 5 tiers. First 5 El Dorado helps to facilitate quality early childhood education in our County, works tirelessly to communicate the benefits of new programs, and encourages parents to choose a high level of care for their children. Kathleen explained the significance of choosing a quality childcare provider, “It is important that families can look beyond cost and location when choosing a caregiver. It is important that your caregiver has a strong relationship with your child, is nurturing, and engages him or her throughout the day.” Kathleen presented the County’s work at the National QRIS meeting in New Orleans this July. 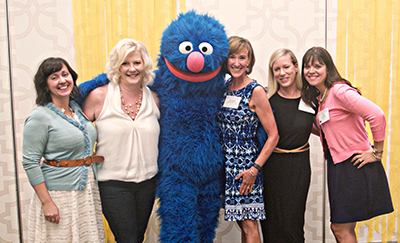 Congratulations to Kathleen, Elizabeth, and all the High 5 for Quality team members in El Dorado County for working to increase the availability of high-quality early childhood education to families in the community. For more information on choosing high-quality child care, contact Choices for Children at (530) 676-0707.